Amarco.. means beautiful place - is a luxurious apartment, with waterfront views of the beautiful Clarence River at Iluka on the North Coast of NSW. Amarco, with its riverfront location, is the perfect place to enjoy all that Iluka has to offer. Three spacious bedrooms and two comfy living areas provide plenty of areas to relax and enjoy the serenity for which Iluka is renowned. The choice is yours! 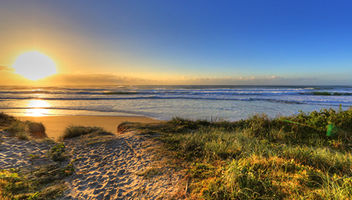 Beautiful beaches abound - the relaxing Clarence River or the rugged beauty of Iluka's many ocean beaches. 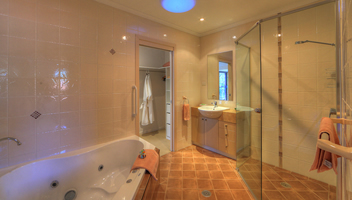 2 person spa bath and separate shower in each, complimentary toiletries. 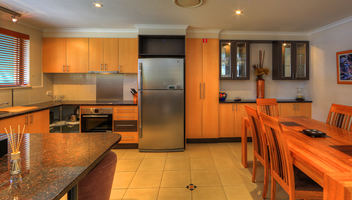 Easy access to Iluka's beautiful river and surf beaches. Iluka, which is Aboriginal for ‘by the sea’, is a sleepy fishing village nestling on a sandy peninsular with pristine beaches on one side and the mighty Clarence River on the other. With the unspoilt beauty of the World Heritage Bundjalung National Park with its abundance of wildlife surrounding the town, Iluka is ideal to unwind and relax. Amarco, with its riverfront location, is the perfect place to enjoy all that Iluka has to offer. Three spacious bedrooms and two comfy living areas provide plenty of areas to relax and enjoy the serenity for which Iluka is renowned. Verandahs afford uninterrupted views of spectacular sunsets over the northern arm of the Clarence, while the kitchen and laundry offer all the modern conveniences of home. We welcome the opportunity to share our wonderful area with you and you can find our contact details by clicking on ‘Booking info’ on the menu bar or visit our gallery page for more photos of Amarco and Iluka.